this is prague, by wishfish. This may not be what you see in most people’s vacation shots, but to me it means Prague just as much as any photo of Charles Bridge. 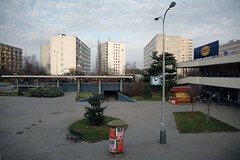 I spent lots of my time in Prague in neighborhoods like this, in Opatov or Pankrac (Hey, I can see my house from here!). We traveled around the city every day, so we never felt stuck in those neighborhoods. I can see how it could be oppressive to live in that kind of environment for a long time. But to me these photos mean Prague, and a personal connection that I rarely feel from photos of Prague. 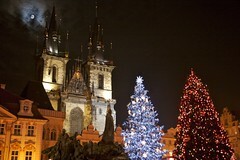 Moon over Prague Christmas Market, by JoseyWales. Even though it’s too late for Christmas. Here’s another nice one. 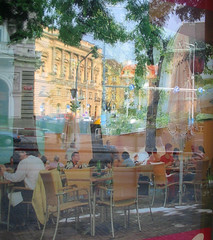 Bar + Reflection, by Prague Pubs. 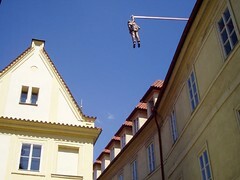 Hanging statue in Prague, by RipperDoc. Following Prague pictures on Flickr means a lot of repetition: Here’s the castle, here’s the clock, here’s Old Town Square, here’s my beer. But sometimes repetition means new views of something I love seeing again and again, like Comrade Lenin here. Whenever he appears, I smile. Of course I posted my very own. I have hundreds of digital pictures of Prague from my last trip (over four years ago now! ), but I’ve only posted a handful online. I do watch Flickr for pictures of Prague, which is how I found this one. I subscribe to the RSS feed for the tag “Prague,” and see new pictures of the city every day in my RSS reader. And that doesn’t even include the ones tagged with “Praha” or “Prag” or any number of other possibilities. It’s a great way to stay in touch with the city. What few pictures I’ve posted myself are posted in response to something I’ve seen in someone else’s photostream. You can see them in my Prague set.